Millions of people use Wi-Fi every day to connect wirelessly to the Internet through their home or work routers; I know I do, not only for some of my PCs, but also for my smartphone and other portable devices. It’s a critical and integral part of our connected lives, but just how much do you know about Wi-Fi? The invention of Wi-Fi is attributed to Australian organization CSIRO as their patented technology forms a critical part of the 802.11 standard; however several other technologies from other institutions and companies form the current Wi-Fi protocols. Many major tech companies infringed on CSIRO’s Wi-Fi patents and so they managed to scrape at least $250 million from settlements. Wi-Fi is a brand name owned by the Wi-Fi Alliance that is used for the IEEE 802.11 wireless standard, and so often you will see both “Wi-FI” and “802.11x” used to mean the same thing. The x in 802.11x refers to the type of protocol, with generally a letter further along in the alphabet indicating faster wireless throughput. 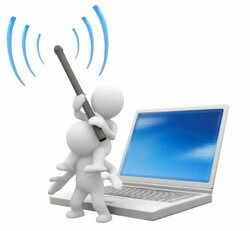 At the time of writing 802.11ac is the newest with a maximum single-link throughput of 500 Mb/s.